16-17 days supply at one level dessertspoon a day. The highest quality available, low temperature, low oxygen CO2 dried. 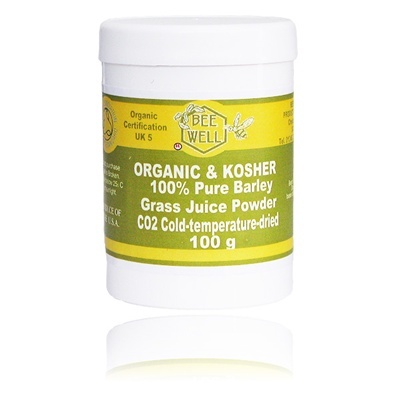 Barley Grass Juice Powder is more convenient to take & better value for money - just 1 teaspoon is equivalent to 6 teaspoons of ordinary barley grass powder. The low nutrient, hard to digest cellulose is discarded but the powerful nutrients & enzymes remain intact and almost identical to fresh Barley Grass. 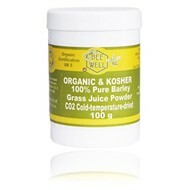 After taking Barley Grass daily for as little as a week, many people report an increase in energy, better hair, skin, and nails, and increased regularity - all signs of good nutrition. One dessertspoon daily for a pleasant, refreshing drink that provides, broad spectrum, food state nutrition. For deep detoxification, you may use up to two dessertspoons daily. Very sensitive types should start at a teaspoon daily and gradually build up. Organically certified in the USA, natural & pure, free from any artifical additives, preservatives, flavourings, sweeteners or GM ingredients.